Police Department, NDSU Police Department, Cass County Sheriff’s Office, Moorhead Police Department, Clay County Sheriff’s Office, FM Ambulance, and Sanford Lifeflight. The Tactical Unit is utilized for high risk search warrant service, barricaded individuals who have threatened or may pose a risk to the public or law enforcement, hostage rescue situations, and many other situations that are viewed as extremely dangerous in nature. The Tactical Unit is made up of three smaller teams that perform specific functions during different operations. The Breacher Team is utilized to gain entry into secured or barricaded structures and rooms within those structures. The Less Lethal/Gas Deployment Team is utilized to deliver chemical agents if necessary, and also to deploy less lethal means to uncooperative individuals when needed. The Sniper Team is utilized to observe and report real time information of the incident to the rest of the team as well as to provide precision lethal fire to protect innocent civilians, and fellow law enforcement officers when necessary. The Tactical Unit has one commander, one assistant commander, 18 tactical operators, four snipers, and six tactical medics. The Bomb Unit is utilized in assisting the community and local law enforcement agencies in the education, location, and disposal of all energetic materials. The Bomb Unit is often utilized with the Tactical Unit and Negotiations Unit on large scale events where there could be a potential for dangerous materials or explosives. The Bomb Unit has different types of technology that can assist the other units to include x-ray machines and bomb robots, capable of sending real time video and audio to the rest of the Team. The Bomb Unit has one team leader and eight bomb technicians. incidents. The Negotiators are highly trained in effective communication and listening techniques. The law enforcement officers on the Team pride themselves on their professionalism and compassion for the individuals they deal with. The job of a SWAT Negotiator can be extremely stressful as the negotiators are tasked with bringing a sense of calm and understanding to often very chaotic situations. Medical support is provided by a team of paramedics assigned to Red River Valley SWAT. Six paramedics, one from Sanford Hospital Life Flight and three from F-M Ambulance, work under the direction of an emergency physician from Sanford Health and provide Tactical Emergency Medical Support (TEMS). TEMS has been a part of the S.W.A.T. team since its inception. TEMS responsibilities include injury control, preventive medicine, monitoring officers' health during training and incidents and health maintenance. 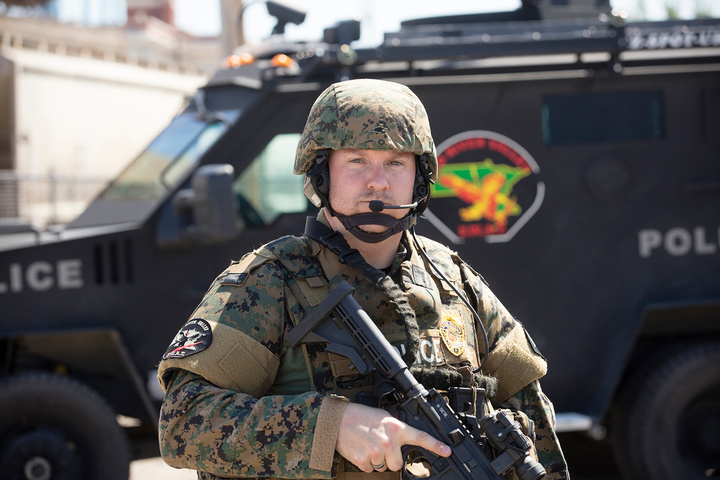 The medics train and deploy with the SWAT team and provide on-site medical support for law enforcement, suspects, hostages and bystanders in an unpredictable, sometimes hostile, tactical environment. The medics have special training in many areas including tactics, building clearing, firearms operations, bullet wounds, defensive tactics, handcuffing/searching, rappelling, K9 medicine and clandestine lab awareness. TEMS is a tool used to help the SWAT team meet its law enforcement and public safety objectives.